This is a sixteen week e-course designed for personal empowerment through color. Learn how color affects your life. Experience the vibration of color through all the senses. Discover what colors you need and what colors enhance the strengths you have already developed. For those interested in becoming a Certified Chromatologist, this is the first step. 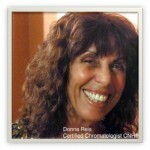 This Course is $325.00 and includes your personal COLOR Vibration® COLOR Balancing Program.